The President of the GCM Mr Bill Papastergiadis said: "Following three meetings, over the last year we reached an agreement with the National Library of Greece (NLG). The NLG will open its doors to our members via the new library we are creating at the Greek Centre. Among other things, our members will be able to access the National Library's archives including over 50 original handwrite bibles and numerous other historical texts." Mr Papastergiadis continued “The meetings were facilitated by the Member for Karditsa, Ms Chrysoula Katsavria-Sioropoulou. Ms Katsavria played a pivotal role in these engagements. Equally the director of NLG Mr Tsimpoglou was keen to engage with the Greek Diaspora. For Mr Tsimpoglou, this initiative with the GCM falls precisely within the NLG’s Charter. The Hon General Secretary Mr. Kostas Markos, who participated in these meetings, expressed his satisfaction for the agreement. "We are very pleased with the agreement. Not only our members, but also the whole Greek community and especially Modern Greek students will benefit. The agreement opens a new communication channel with Greece and the Greek diaspora, “he said. At the most recent meeting, the Director of the National Library Dr Philippos Tsimpoglou spent over 3 hours guiding Messrs Bill Papastergiadis and Costas Markos through the new library premises in the Stavros Niarchos Foundation, where it would soon be relocated. Also in attendance was Professor Nikos Papastergiadis of the Melbourne University of Melbourne. The National Library of Greece is to be relocated this year to its new premises at the Stavros Niarchos Foundation for Culture. Mr. Papastergiadis said he was extremely impressed with the new premises of the National Library and the Stavros Niarchos Foundation in general, and was excited by the possibilities of cooperation between the NLG and the library of diaspora that will be created by the GCM. Dr Tsimpoglou said he would provide every possible assistance to the new GCM initiative, and that he is open to new collaborations. 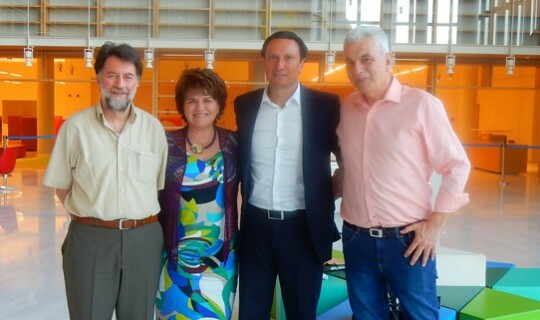 He discussed several projects of the NLG where the GCM can participate through its new library and the Greek schools. Mr. Papastergiadis will meet once again this month with Dr Tsimpoglou and Mrs Katsavria-Sivoropoulou to further advance the agreement.